I was intrigued by the trailers I'd been seeing for the animated feature film, Coraline. We sat down to view the DVD we'd borrowed from the library and were quickly enthralled by the picture. She Who Must Be Obeyed was completely drawn in by the spooky –even scary– nature of the fantasy tale. I very much enjoyed the story, yes, but the look, sound, and feel of the film kept me smiling throughout. Traditional pen and ink film 2D animation is pretty much gone, replaced by computer generated images. Depending upon the studio and makers, 2D art may not suffer and it surely helps having machines generate the tweens. Stop motion animation has also gone largely to silicon-rendered 3D imagery. There's often something missing from stop-motion's 3D substitute, however, and it's hard to put your finger on just what it is. Though I've been a longtime fan of Pixar Animation Studios' wondrous works –dating back to when I saw Luxor Junior at an animation festival– I've retained an admiration for the craftsmanship and the art of handmade stop motion films. 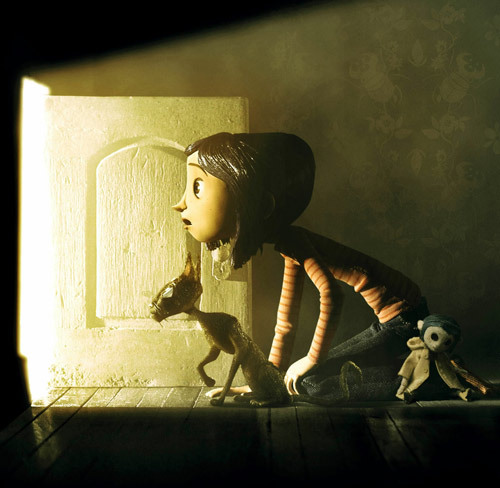 Coraline, while it incorporates some CGI, is basically hand-crafted, old-school stop motion and it is beautiful, raised to exceptional levels of quality. We purchased the Collectors Edition DVD package at a local store so that we could have the bonus features and were so very glad we did. The disc presents the how-it-was-done details I really wanted to see. Far from spoiling the fantasy, the "making-of" documentary deepened my appreciation for what Laika Enertainment had done in their first feature film. The level of detail in the animated figures and their sets is astounding. It's wonderful to know Laika's out there making films this way and I hope to see more from them. I highly recommend Coraline to a wide range of audiences including fans of fantasy, weirdly creepy stories, and animation. I do not recommend this film for small children as they will be frightened. This reminds me of Alice, a Jan Švankmajer (aka Swankmeyer) film from 1988. It's a stop-motion retelling of Alice's Adventures in Wonderland: surreal, creepy in parts, downright disturbing in others. You might also find Barry Purves' Screenplay interesting. I'm just in awe every time I watch it.I think I know what you mean about the difference between stop motion and CGI stuff. I think one thing is texture, for want of a better word: there's something about the quality of the tiny variations on real surfaces that even very good CGI doesn't quite manage to capture. The second thing is more prosaic – stop motion typically lacks motion blur. It looks so cool. Now I want to see it.